The Hippo intracellular signaling pathway was initially identified through genetic mosaic screens in Drosophila melanogaster and has gained great interest in recent years as being strongly involved in organ development, stem cell biology, regeneration, and tumorigenesis. 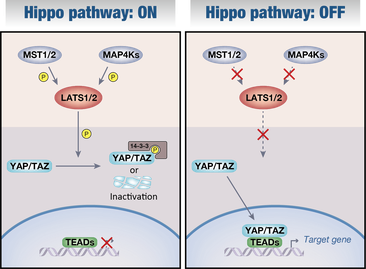 The Hippo pathway is capable of sensing and responding to the physical organization of cells, functioning as a nexus and integrator for multiple signals. A major focus of our lab is to understand physiological regulations of and by the Hippo pathway in development and cancer.